What is the difference between a fake and an expertly restored genuine but damaged painting? The line that differentiates between the two is extremely fine and, as such, the skilled restorer is sometimes also the skilled forger, as was the case with the twentieth-century Dutch artist Han van Meegeren. Fig. 1. Attributed to Han van Meegeren The Laughing Cavalier, pastiche after Frans Hals (updated c.1923). Oil on panel, 36 cm in diameter. Whereabouts unknown. Fig. 2. 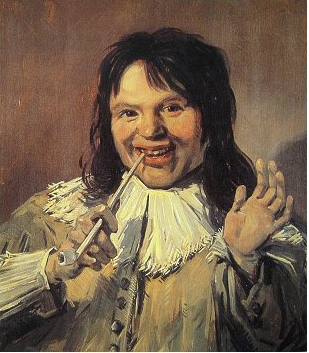 Attributed to Han van Meegeren The Satisfied Smoker, in the style of Frans Hals (updated c.1923). Oil on panel, 57 x 49 cm. Groninger Museum, Groningen. The Dutch artist Han van Meegeren (1889–1947) is best known for his fake Vermeers, at least one of which ended up in Nazi hands. However, his first (almost successful) known forgeries were actually restorations. He and Theo van Wijngaarden (1874–1952), his partner at the time, scoured around for low-valued works, genuine only in their antiquity. In 1923 they managed to scout out two panels, in the style of Frans Hals (1580–1666), that were “murky and badly damaged” (Wynne 2007 – see Endnote 1). The outline of a composition existed, in this case portraits, and the spirit of the times was already evident in the technical application, that is, in the way epochal followers of Frans Hals handled materials. Han had just to clean and stabilize the paintings, and then to extensively remodel them. Was this repainting or overpainting, or even “‘inpainting,’ ‘loss integration,’ ‘loss compensation,’ or ‘retouching’” (- Hill Stoner & Rushfield – see endnote 2)? The answer is semantically determined by the aims of the practitioner, not by the response of the viewer. Nevertheless, what Han and Theo did next was to cross the line. Han tried to mask the extensive freshness of his paintwork by using lavender oil, at Theo’s suggestion, and Theo explained away any suspicious objections of critics with the phrase “recent restoration” (Wynne 2007). Theo organized for the panels to be shown to Cornelis Hofstede de Groot (1863–1930), a former “deputy-director of the Mauritshuis and a critic instrumental in defining the oeuvre of both Rembrandt and Vermeer”, and had them presented to him as a recently restored possible autograph Frans Hals (Wynne 2007.) In this way Han van Meegeren and Theo van Wijngaarden became criminals. In order to raise a blended surface retouchers will sometimes add faked painted craquelure. High levels of retouching are demanded, even today, with the aim for restored works to be as fully integrated as possible, that is, original areas merging visually with filled and retouched areas. Such practices facilitate the ease with which cavalier restorers can cross that fine line from restoration to forgery, making it much easier to slip forgeries into an artist’s canon. 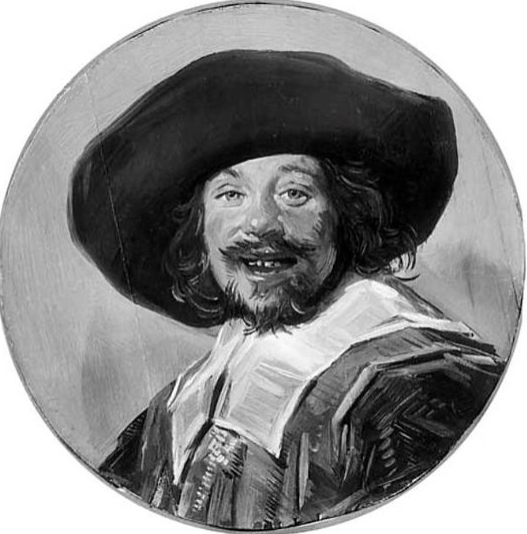 Furthermore, as Han and Theo were both restorers, they knew the value of having panels in less than optimal condition, which they then fixed, adding to the veneer of originality as was the case with one of the Frans Hals copies, The Laughing Cavalier (updated c.1923 – Wynne 2007, Fig. 1). Indeed, throughout his career Han was careful to bash his works about a bit, and then “restore” them again, in order to sustain the authenticity of age. Han van Meegeren was not only a practical artist, but it would appear also a studious connoisseur. He knew his Old Masters. “His long years studying the Golden Age and his passion as an apprentice for imitating the work of the masters gave him an understanding of Hals’s rapid brushstrokes, his dramatic shading and the characteristic silvery sheen of his work, so different from the golden glow of a Rembrandt” (Wynne 2007). Han was no mere imitator, however. He took a discarded copy by an unknown artist, and by careful restoration methods and creative additions, he turned it into an autograph “Frans Hals”. De Groot took the bait. He wrote a certificate for the van Meegeren The Laughing Cavalier, categorically attributing the work to Frans Hals, and the panel sold to the auction house Frederik Muller for the equivalent of £120,000 in today’s money (Wynne 2007). This is evidently substantially more than it would have realized sold honestly as the heavily restored copy it was. The second panel, The Satisfied Smoker (updated c.1923, Fig. 2), de Groot bought directly from van Wijngaarden as a Frans Hals and added it to his own collection (Lopez 2009 – endnote 3). However, it did not end all in the bag for Han and Theo because even before the cheque was cashed another art historian and connoisseur Abraham Bredius (1855–1946) stepped in and denounced The Laughing Cavalier as a fake. De Groot fought him on the issue, claiming that evidence of modern materials found on the painting, which was subsequently studied by a panel of experts, were only the result of the recent restoration. The team found artificial ultramarine, cobalt blue and zinc white, in the “extensive recent repainting” (Wynne 2007). It is not clear if these pigments were found only in infill sites, or also over more authentic pigments. Indeed, by definition, the presence of these pigments on areas of loss would not constitute immediate grounds for denouncing a work fake, even today. De Groot went on to defend his authentication of this work in print, publishing an article “Echt of Onecht [Genuine or Forgery]” in 1925 (Wynne 2007). De Groot never accepted that Han van Meegeren’s The Laughing Cavalier was a forgery. In fact De Groot never even knew the forger was Han van Meegeren, as he died in 1930 long before van Meegeren was outed. De Groot bought The Laughing Cavalier from Frederik Muller (Wynne 2007) and his collection thereafter was bequeathed to the Groninger museum in 1930. The Satisfied Smoker in the style of Frans Hals, but now attributed to Han van Meegeren, remains in that museum. The other work on panel, The Laughing Cavalier, is whereabouts unknown. These events, although historical, highlight the role of restoration not only in authenticating artworks, but also in (re)creating them. Susan Grundy is an independent art historian and collector. She is currently exploring the concept of Old Master collecting, restoration and authentication as a type of Performance. Her Doctoral (2009) and Masters (2005) research concentrated on Art and Optics, in the new field of quantitative, scientific and technical art history, and she has subsequently published extensively on issues of authenticity in art. 1 Wynne, F. 2007. I was Vermeer: the forger who swindled the Nazis. London, Bloomsbury: pp 74-77. 2 Hill Stoner, J. and Rushfield, R. (eds). 2012. The conservation of easel paintings. London and New York, NY, Routledge: p. 607. 3 Lopez, J. 2009. The man who made Vermeers: unvarnishing the legend of master forger Han van Meegeren. Boston & New York. Marina: p. 9. This entry was posted on July 1, 2016. It was filed under news and was tagged with Abraham Bredius, C. H. de Groote, Frans Hals, Frederik Muller, Joyce Hill Stoner, Retouching and forgery, Susan Grundy., Theo van Wijngarden, Van Meegeren.